Alex Ekwueme Federal Univesity, Ndufu-Alike Ikwo (AE-FUNAI), Abakaliki, Ebonyi State List of Postgraduate Programmes and General & Specific Admission Requirements (M.Sc, PGD & Ph.D). Following the approval of the Postgraduate School Board by the Alex Ekwueme Federal Univesity, Ndufu-Alike Ikwo (AE-FUNAI), Abakaliki, Ebonyi State the full list of the Postgraduate Programmes and Admission Requirements as approved by the National University Commission (NUC). Outlined below are the Postgraduate Programmes and Admission Requirements. 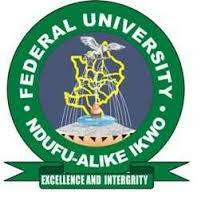 For Application Procedures into the FUNAI Postgraduate School Click Here.